It is a type of fried rice, most of the people from place make this recipe with left over rice. Lets know the process. if you want you can add any dal like urad dal, soaked chanadal and ground nuts(they should be cooked in oil). 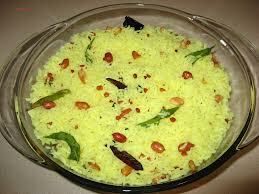 1) Cook rice and allow it to cool. 3) Heat oil in a shallow pan add mustard seeds, cumin seeds, as they just done add green chilli and onions. 4) Add little salt, fenu greek seeds, ginger garlic paste mix it till the raw flavour goes away. 6) Finally add coriander leaves, coriander powder and rest salt as per your taste and warm the rice. Enjoy this recip'e with chicken soup and onion gravy it gives wonderful flavors even it's own ....!! !